This is a beautiful picture. Very Powerful. However, some see it as a vicious form of reverse racism. 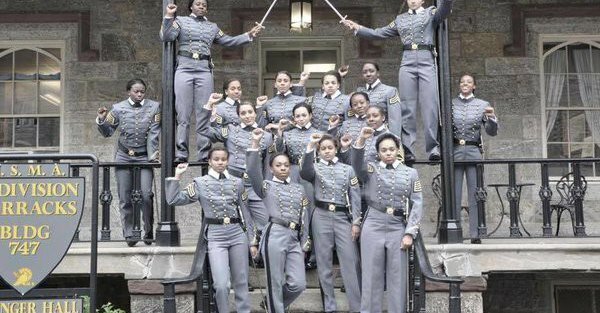 Last week, the Army launched an investigation after blogger John Burk, an Iraq veteran, posted a photograph on Facebook of sixteen black women cadets at West Point posing for their “Old Corp” photo, a time-honored tradition in which modern senior cadets mimic the old-style, black-and-white photos of cadets long past. Other than showing nearly every black woman in the graduating class (which, in itself, is sad and begs the question of whether the Academy should step up their “diversity outreach” efforts), nothing about it is remarkable. But Burk took issue with the “raised fist” gesture of the cadets, which he claims is meant to represent support of the #BlackLivesMatter movement. Nevermind the wealth of photographs that show white male cadets making the same gesture.